Northwest Arkansas is a long way from the 48th parallel, which is considered the “hop belt” – the optimum latitude for growing our favorite bitter ingredient. Unfortunately for my hop farmer aspirations, northwest Arkansas is where my tiny hopyard is. My hopyard consists of six spaces: two spaces where English hop varieties Golding and Fuggles used to reside (until they gave up the ghost), two spaces where German varieties Hallertau and Saaz barely cling to existence, and two spaces where American Cascades are loving life. My two rows of hop trellises receive full sun, and in Arkansas that means heat coupled with typically dry conditions as summer wears on. While its European cousins have withered in the heat, Cascade is a variety that doesn’t seem to mind living in Razorback country. In fact, most years I’m able to get two harvests from the Cascade bines. I pick them using a ladder to leave the bines up until they’re done and dead-looking at wintertime. This week, I noticed a couple of the Cascade hop cones were turning brown entirely, and the rest were beginning to get dry and brown around the edges. It usually doesn’t take long for the hops to get toasty, so I checked between the bracts of the hop cones and found the lupulin glands to be a deep yellow. 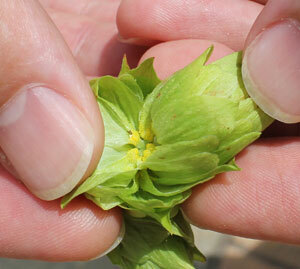 Lupulin is the yellow waxy stuff that is home to the alpha acids of the hops. The alpha acids are what we want in our brews to give our beers the bitterness, flavor, and aroma we crave. It doesn’t matter if the cones are a bit brown, as long as the lupulin glands are in good shape. I leaned the ladder against the trellis pole and climbed up to begin my picking. In the commercial hopyards, the entire bines are cut and put into trucks. Then, the leaves and cones are beaten off the plant, and a series of inclined belts separate them out. No such luxury here. One by one, and sometimes two by two, fat Cascade cones went into my plastic Walmart sacks (also known as Arkansas tumbleweeds). After about two-and-a-half hours, I had two plastic bags bursting at the seams with hop cones. The first from the east hop hill contained one pound, eight ounces (680 grams). The second from the west hill held one pound, three ounces (538 grams). I noticed that the cones from the east set of bines were drier than their westerly neighbors – possibly a result of the eastern hop hill getting a head start in the growing season for some unknown reason. 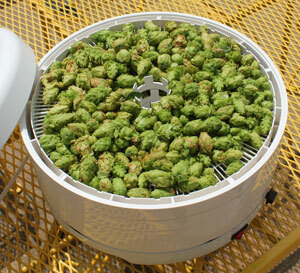 Hops can be used freshly picked in fresh hopped beers. Some refer to them as “wet” hopped beers, but that term makes a certain set of craft beer lovers uncomfortable. That set is called “Tom Schmidlin.” However, since I didn’t have the time to brew right away, I needed to dry them for long-term storage. Commercial hop producers use large buildings called “oasts” to dry their hops. Hops are collected into rooms where heated air is pumped up through the cones until they are dried to a certain percentage of moisture. Drying to that specification is important to commercial producers. One reason being hops baled while too moist can burst into flames while being stored. I’m not so worried about my hop freezer bursting into flames, but I do want my hops to be dried a bit to make them easier to use and to be able to weigh them accurately. My oast is a home food dehydrator. The particular model I use is a Nesco Gardenmaster. I like it because I can dial the temperature down to 95˚F (35˚C) to help preserve the volatile oils of the hops as they dry. In the past, I have used window screens in a spare bedroom raised upon cardboard boxes to lay the hops out and dry them over time. This works well, but it takes up time, space, and my wife’s patience. To store the hops and to make them easier to measure and use, I weighed out an ounce of cones at a time, bagged them, and used a vacuum sealer. This compacts the hops and reduces the threat of oxidation over time. I noted the weight, date, and hill location with a marker on each bag before throwing them into the freezer. 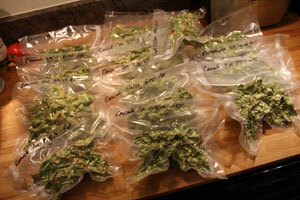 In the end, I counted a little more than 13 ounces (368 grams) of dried homegrown Cascade hop cones. The aroma from them is typical American grapefruit with a tiny bit of grassy, almost onion-y notes around the edges. Without sending them to a lab, there isn’t a way for me to get a reliable alpha acid number on them. I plan to make some small batches to evaluate later on. Growing hops at home is fairly easy to do. Once the hops are established, the work mainly consists of pruning the initial bine sprouts down to four or five on each hill, picking them, and getting rid of the dead bines as they die back for the winter. If you find varieties that are suited to your area, the plants are very attractive and are great topics of conversation with your friends over a cold homebrew in the yard. I’m looking forward to playing with my Cascades in the coming months. James, Great article!! will you allow me to promote this on my website? we are currently doing a overhall of the website but it is to re launch with in the next 10 days and one of our first features is about growing hops…. The television show will air to over 50% of the country the first week in September and it will be year round with 21 episodes already filmed. beer geeks tv is our F b page and twitter you can follow us at beergeeksontv… let me know if it is ok to use Cheers! It would be great for you to put a link on your site to our article. Good luck with the series. Michael Ferguson’s a great guy. Cheers! I have 4 different Hops growing in my back yard. Cascades seem to be the easiest to produce. I never seem to really know when to harvest. Of the 4 different varieties cascades produce the most. On BBR, Dan Dettmers went into a good amount of detail on when to pick. One line that sticks with me is when he said the lupulin should be “school bus yellow.” He also said not to worry about the bracts getting brown around the edges. James, great writeup! I have my very first Cascades growing this year; while I don’t hope to harvest a lot, I’m looking forward to getting at least some to work with. Eager to see what your evaluation is once you brew with them. Cool. I got more my first year than I was expecting. It’s been a while since I’ve played with them. Curious to see if the character has changed with time. Have you tried any other american strains of hops? Thanks and good luck with the site! I haven’t, but I believe Andy Sparks has had good luck with Magnum. I’m growing Cascade hops for the first time this year, but despite a week our so of 25-30°C sunny weather I’m not sure Manchester, England is the optimum place for hops. I’ve got a strong bine growing up my trellace, but no actual hops as yet. Plenty of summer to go though! I’m hoping to brew only my second ever green hop beer at the end of the summer. 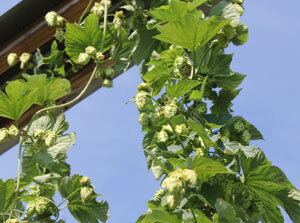 Great article – nice haul on your hops so far. One tip I have for packaging hops in bulk is to seal them all in one freezer bag, but leave a lot of extra headspace in the bag. This way I can open the bag, take out the amount I need, then reseal the bag. Separating it into single-ounce portions is convenient, but takes up more freezer space, and it still leaves you with the “what do i do with this half-ounce that’s left over” issue. Thanks James. Would be cool to see some video of this. My homegrown cascades are going great guns in their third year. We’re only about a month into our actual growing season due to late snowfall and cool temps in Wisconsin. But the recent heat seems to be allowing the plants to make up for lost time. I’m looking forward to harvest time, should end up with more than a pound based on last year’s crop. Thanks for the tips on the dehydrator. We actually had snow in May down here. Crazy year. I started some Cascade hops this year, after hearing James and Chris Colby both explain that their Cascade hops seem to do well in our dry, southern climate. (I’m in middle Tennessee). My hops are doing surprisingly well for their first year, though not ready to harvest just yet. I just bought a food dehydrator and vacuum sealer, in anticipation of harvest time, though. I think the best way for home hop growers to estimate the bitterness of their hops, short of sending them to a lab, is to brew a test batch. I think I’ll try a one-gallon batch with mine. Well done, James. My Cascades are good producers, better than the Fuggles. I’m in Central NY State, and mine are nearly ready to make the 1st harvest, probably a few days to a week, which is a few weeks early for us. We’ve had a good bet of rain and lots of really hot weather. I missed you in Philly, so many people, and such a short time. Sorry we missed each other. It was quite a madhouse at times in Philly. Next time!